Growing a business is no mean feat, but a couple of guiding principles can speed your progress. In this clip from the latest SuperFastBusiness mastermind call, learn how to focus your efforts for optimum business growth. Only work with winners. [Click To Tweet]. One inch wide and a hundred miles deep. [Click To Tweet]. Trend awareness. There’s one thing I’ve noticed of people who succeed. Quite often, they’re picking the right sort of markets or times. Like now, e-commerce is a red hot rocket, no doubt about it. When I grew my SEO business explosively, it was like going through a purple patch in history. SEO was the thing to have, and I had it. And we grew it big and fast. The whole online thing is a great trend to be in. We’ve seen the market of e-commerce just start to decimate retail. There’s a lot of empty shops out there, when you walk the streets, compared to 10 years ago. Retail is just getting harder, so the online thing is good, trend awareness is good within the online, just pay attention. When I started, I was selling software that worked on PCs that built websites. That’s not a good thing now, but it was then. WordPress killed it. And I spotted it early, I let go of that. Same as when SEO was starting to get a little bit more interesting, I spotted that, and I moved into WordPress development. When people wanted to deal with infoproducts, I spotted a trend for community, and the fact that people liked to be social. Before all of the social sites were popular and before they did groups and stuff. You know, I was already there. And I think if I look at my business now, it’s very solid because I’m in the right spots, and I’ve got fewer things now than I had five years ago, far fewer products and far fewer areas of focus. And that’s really something you’ve got to pay attention to. You could be a genius, but if you’re in the wrong market at the wrong time, it’s going to be hard work, and if you go back to a few of these trainings ago, I talked about “The Star Principle,” Koch is the author, and it’s just talking about only working with winning trends. Even if you’re a lousy property investor in a property boom, you’re going to do well. And that’s what he does but with companies. You pick the fastest-growing company that has the market share, and you’re going to make a profit. So pick the right trends, that’s the first thing. 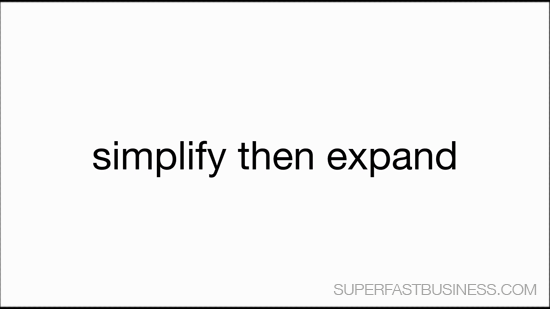 Another thing is, you’ve got to simplify and then expand. This is sort of another way of saying, stop doing so many things, just keep it really simple, and just go expand that simple thing. So this is also called one inch wide and a hundred miles deep. OK? Get really good at the thing you do and just do that a lot. So I’ve said it three ways now, hopefully it’s sinking in. The big problem I see people doing is trying to take on too many things and they go shallow. I’ve seen it, I’ve seen people in the community even a bit confused about what they’re doing. They’re trying to do a business service but at the same they’re trying to coach people. It’s fine once you’ve mastered the game, but not while you’re on the way up, because you lose all credibility. You can’t do a half-assed job at everything, because it’s going to ruin your reputation. You want to be very, very good at something, and only then do you consider leveraging that with the next thing. Just to put this in pure perspective, when I first started online and found my model that was working, the affiliate model, I only did the affiliate model for the first two years. That was my focus, and I learned everything around just one product. One product as an affiliate, to six figures. So hopefully, this really hits home. If you’re trying to do more than one or two things, you’re slowing down your success. Only once you’ve reached success with the product or the service that you’re doing well with, do you earn the right to try the next thing or to leverage it.